CSIRO has launched its “FloWorks” Centre for Industrial Flow Chemistry today in Clayton, Victoria. Dr. Christian Hornung: Hi. My name is Christian Hornung. I am a Research Scientist at CSIRO and I work in the Flow Chemistry area. The Centre for Industrial Flow Chemistry is a new facility here at Clayton. It is a technology platform that provides access to CSIRO’s cutting edge flow chemistry technology to industry as well as academic researchers. Flow Chemistry’s a smarter way of making chemicals. other than in a classical batch process, the starting materials are fed into the reactor continuously and this is where the reaction takes place. If you use multi stage processing, you can eliminate the need for manual handling of chemicals in between steps and that greatly improves safety. and when you integrate smart monitoring and online analysis the whole process can be automated. So, what are the benefits of flow chemistry for your business? and that means that they’ll have less energy costs, a much more efficient process, less waste and a much safer environment. At the Centre for Industrial Flow Chemistry we offer a complete package which is quite unique. where he can do the manufacturing of their product. In the new Centre, we will combine the small-scale capabilities for discovery as well as our large-scale reactors under one roof. and for this technology to be taken up by chemical manufacturers in all areas. Zoran Manev: Boron Molecular is a manufacturer of fine chemicals. The fine chemicals are used in both the pharmaceutical and material science field. that we use to develop a number of our processes or convert them from batch to flow. Flow chemistry will enable us to make purer molecules. So, we will have fewer side chains and fewer issues when we scale up manufacturer from small-scale to larger even tonne lots. The resultant of that is, is that you’re wasting less solvents, less energy and you’re having far less material that you’re discarding into the environment. We’re excited at the prospect of working with CSIRO’s Centre for Industrial Flow Chemistry. and likewise the Centre will continue to develop molecules for us that we will eventually bring back to our facility for manufacturing. In five to ten years’ time I see flow chemistry as being the prevalent chemistry on site. Dr. Christian Hornung: If people want to get access to the facility and learn more about the technology get in contact with us. 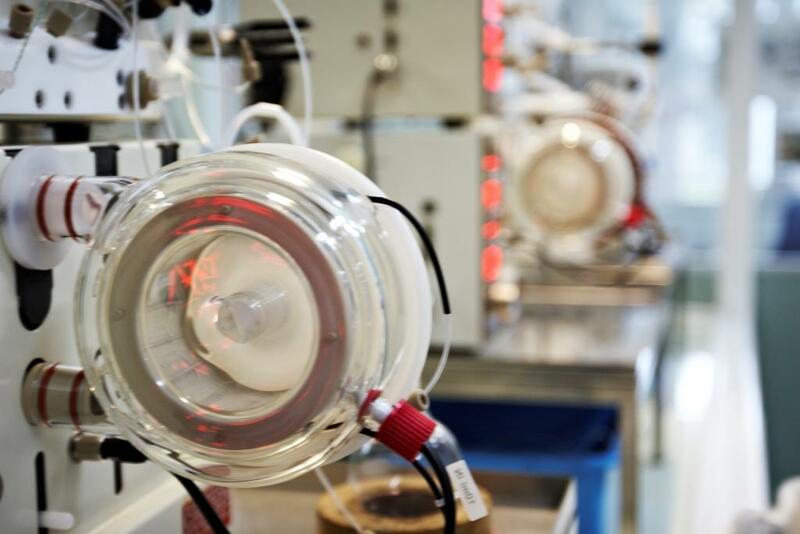 FloWorks will provide cutting-edge research into flow chemistry capability, making it more accessible to the chemical manufacturing industry. 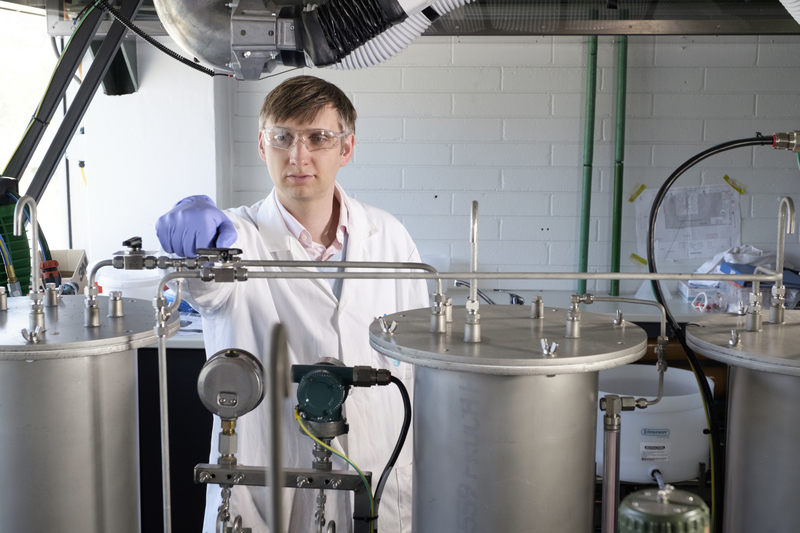 Senior research scientist with CSIRO’s manufacturing sector and director of the new centre, Dr Christian Hornung, said flow chemistry offers a cleaner, smarter and more efficient way of making chemicals. “The benefits of using the flow process include reduced reaction times and plant space, which equate to less energy cost, more efficient processes, reduced waste and a much safer environment,” Dr Hornung said. 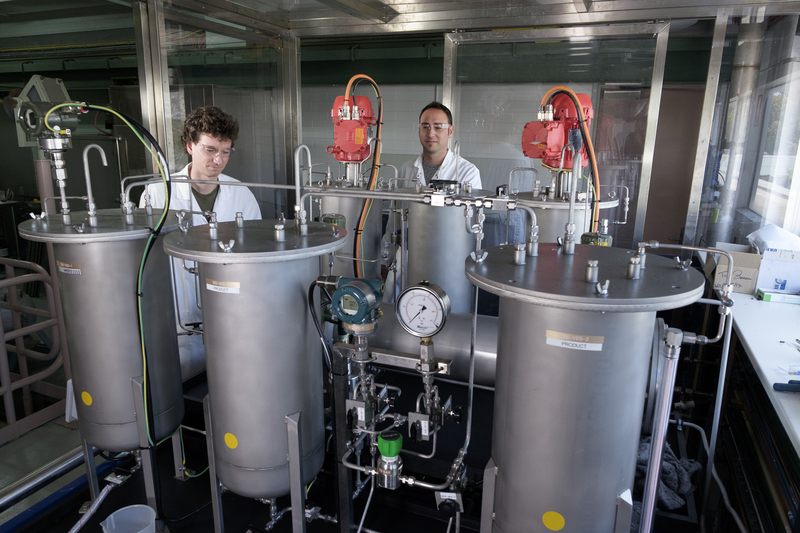 Contrary to traditional batch chemistry methods, starting materials are fed into a reactor where the chemical reaction takes place in a continuous stream, a method that in many cases has proven to be a more efficient and cost effective way of producing chemicals. Multi-stage processing, which eliminates the need for manual handling of chemicals in between steps, greatly improves safety, while in-line purification makes the system more streamlined. Smart monitoring and on-line analysis is used to automate the manufacturing process. 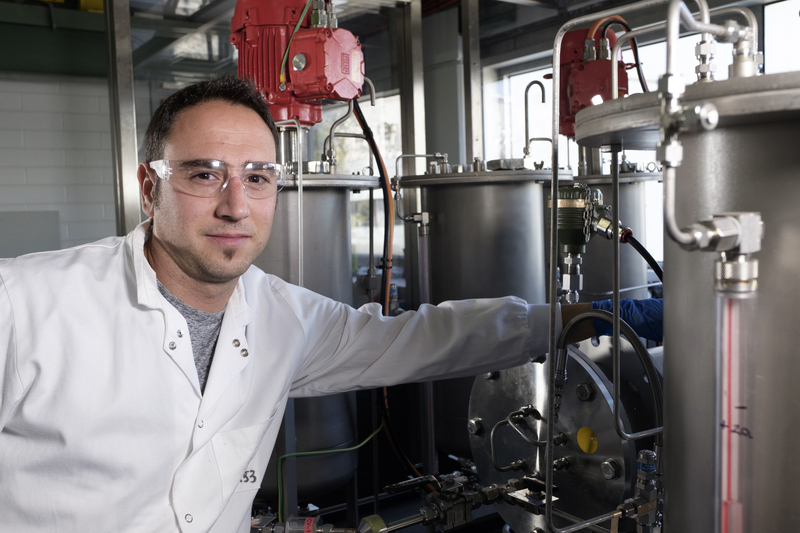 Industry partner, Zoron Manev from Boron Molecular, uses flow chemistry at his Noble Park plant to manufacture fine chemicals for Australian and international pharmaceutical and materials science clients. “CSIRO helped us integrate flow chemistry into our operations,” Mr Manev said. “We use our unit to develop a number of processes or convert them from batch to flow. “Flow chemistry enables us to make purer molecules, so we have fewer side products and fewer issues when we scale up to manufacture from small scale to larger tonne lots. “With flow we’re using far less solvents and energy and discarding far less waste material into the environment than we would otherwise,” he said. FloWorks offers a unique, complete package all the way through development; from early discovery stages to industrial scale-up and tech transfer. A purpose-built 410m2 facility will be housed at CSIRO’s Clayton site in Melbourne’s south east. Incorporating all of CSIRO’s flow chemistry equipment, its capabilities will range from small-scale discovery tools to large-scale industrial reactors. Dr Hornung said the new collaborative space would generate greater engagement with industry and other research bodies. “I see flow technology eventually being taken up by chemical manufacturers in all areas,” he said. Manufacturing chemical based products is important to everyday life and plays a central role in the global economy. in areas like medicine, food, textiles and household products. but using this method to scale up chemical production can be problematic. There can be issues with waste, for example, heat management or even runaway reactions. Moving to cleaner, more cost effective chemical production is important for sustaining chemical manufacturing in Australia and around the world. 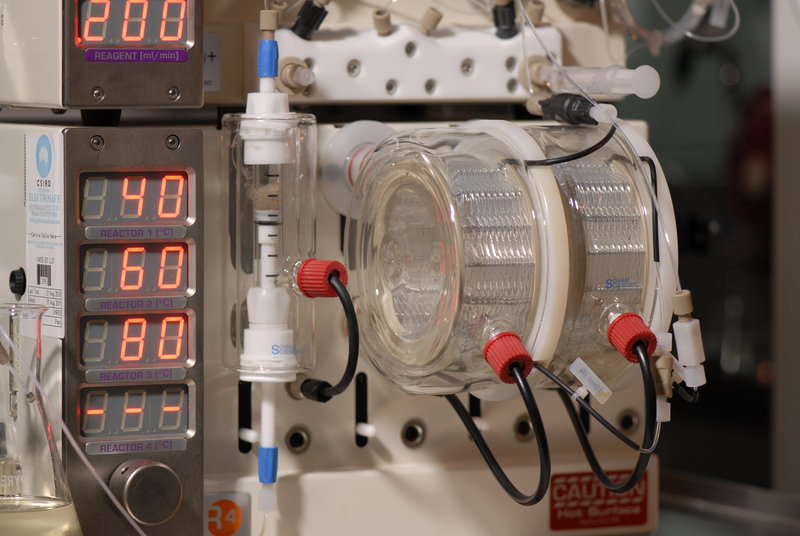 Flow Chemistry is a smarter way of making chemicals. Pumps deliver chemicals to a reactor where chemical reaction takes place inside a continuous stream. Multi stage flow processing eliminates the need for chemical handling in between steps which improves safety. Adding inline purification makes the process more efficient and streamlined. By integrating smart monitoring and online analysis entire chemical operations can be automated. The small dimensions and clever design of these flow channels provide much greater control over the chemical reaction taking place inside. Mixing is fast and efficient and the modular design offers flexibility. Broken parts can be swiftly replaced without shutting down entire operations. Excellent heat control inside the reactor means boundaries can be pushed in a safe environment avoiding waste and hazardous explosions along the way. Because flow reactors operate continuously, making more product simply means running the operation for a longer time. Scaling up reactors is much simpler too. Transferring chemical manufacturing from lab to factory becomes significantly faster and more straightforward with less need to redesign. Flow Chemistry reduces processing time from hours to minutes which in turn reduces required plant space. For industrial chemical manufacturers this translates to lower energy usage, less wastage, increased safety and reduced costs. Cleaner, safer, faster flow chemistry will eventually replace most traditional batch chemistry methods for Chemical manufacture. Director of CSIRO’s new FloWorks Centre of Industrial Flow Chemistry, Dr. Christian Hornung works on an industrial scale reactor at the Centre. Ivan Martinez Botella working at CSIRO’s new FloWorks Centre of Industrial Flow Chemistry. This small scale flow chemistry reactor fits on a desk top.